Access to natural light and views of the outdoors in hospitals can have a positive impact on all hospital occupants, from staff to patients and their families. If you’ve ever stayed in a hospital, or if you’re a medical professional, you might have noticed this yourself – and there’s plenty of research to back it up. 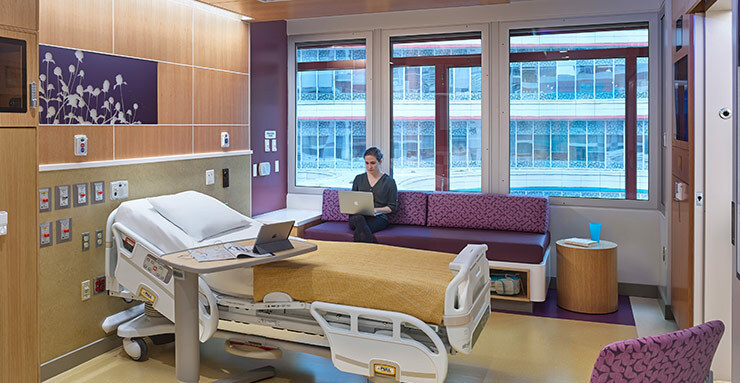 In an International Journal of Energy Engineering study of hospital staff, a staggering 92 percent of respondents said patients are more comfortable in rooms with access to daylight. Additionally, more than three quarters of respondents said daylight in a patient’s room allows them to do their job better. There’s also a great deal of evidence that natural light can help patients recover faster. According to a study from the UK-based Building Research Establishment (BRE), access to daylight in health care facilities reduces average length of stays, speeds recovery times and reduces the need for pain relief. Thanks to its ability to improve thermal and visual comfort, offer unobstructed views of the outdoors and allow for greater control over an indoor environment, dynamic glass is often the perfect façade for buildings. 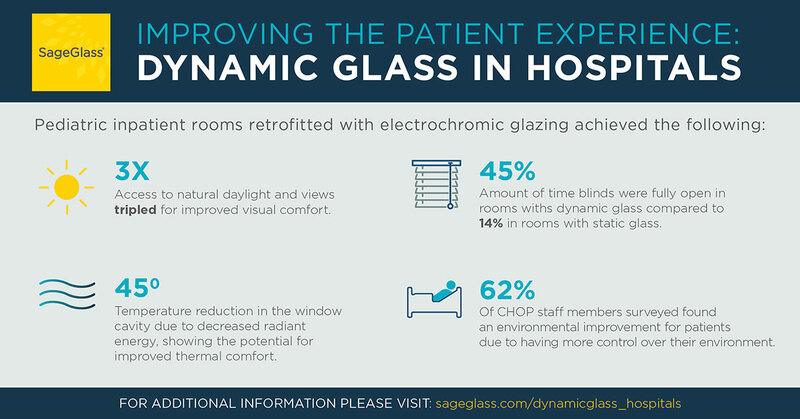 To measure these outcomes, Children’s Hospital of Philadelphia (CHOP) launched a pilot study to determine if installing dynamic glazing, specifically electrochromic glazing, in pediatric inpatient rooms improved the environment for patients, their families and hospital staff. From February to August 2017, CHOP compared two south-facing pediatric inpatient hospital rooms retrofitted with dynamic glazing to an adjacent control room containing a standard low-e glass window. Both sets of rooms used an existing blind system to ensure patient privacy in busy downtown Philadelphia. Exterior light sensors and the electrochromic glass control system were installed and configured to automatically tint, allowing for daylight and glare control within each patient room. Wall switches were installed in each patient room to give patients and their families complete control of the glass. Overall, CHOP staff members found that in pediatric inpatient rooms retrofitted with electrochromic glazing, patients and their families felt they had more control over their environment, which helped patients feel happier. Families also had complete control over their comfort level in the room, which was very important to them. Health care is a “people-centric” industry, and health care facilities like hospitals should be designed with patient and staff needs in mind – including comfort. Dynamic glass solutions do just that by improving thermal and visual comfort, offering better views of the outdoors and allowing people to control their immediate indoor environment. In a health care setting, these factors can aid significantly in both the staff’s ability to carry out their jobs and a patient’s mindset and health outcomes.